I hate email spam and fanatically guard my inbox from it. I try to not give out my real email address unless it’s for an account I need or a service I find useful. These include bank accounts and billing accounts like credit cards and utility bills. But I inevitably receive spam. Gmail does a great job of filtering out most of them. But for ones that get through, I appreciate organizations that add an unsubscribe link in their email footers. They are doing themselves a favor because I’m going to click that link instead of marking their email as spam which might hurt their email reputation and actually make it harder for their emails to get into inboxes overall. Almost all my physical mail is junk, but none of them tell me how to unsubscribe. It’s rather unfair how companies collect and use my email in the first place. They ask me for it when I buy something for the first time without explaining how they’re going to use it, or in the off-chance they do explain, it’s usually about following up on my purchase. In the months that follow, they send me with sales offers and catalogues. Why would a merchant waste the goodwill I gave them by sending me unsolicited mail? I should be asked to opt-in to promotional and marketing mail. Okay, maybe they’re too lazy or their employee forgot. Then at least give me an option to unsubscribe. Not only does it crowd my mailbox, I now have to worry that when I move, some sensitive piece of mail might find its way into a strangers hands and be exposed or used maliciously. 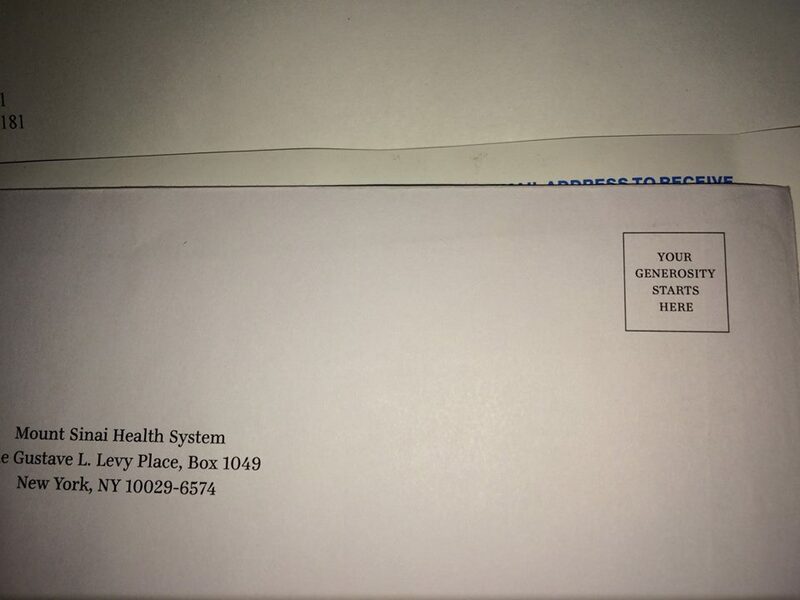 Here’s an example of a letter I received from Mount Sinai. I’ve only visited Mount Sinai once to ask a surgeon about what my options were for two herniated disks in my lumbar. I can’t think of any other way Mount Sinai got my mailing address. The more I think about the letter in the photo above, the more I start to wonder. How and why did my email from a surgical consultation get passed on to Mount Sinai’s fundraising department’s mailing list? Does this violate HIPAA? They should at least provide me a method to unsubscribe myself. Something like a website, phone number, even a mailing address. Instead they don’t even provide a postage paid envelope for the check they expect me to write.